Have you ever been praying the Fourth Glorious Mystery on the Assumption of Mary and wished you had some scriptural or other information for your meditations on this particular decade? We find nothing about this wonderful event in the Bible, other than perhaps some interpretive foreshadowing of it from some Old Testament verses. Yet, if we turn to church-approved private revelations our Blessed Mother gave Saint Bridget of Sweden (in the 14th century) and Ven. Mary of Agreda (in the 17th) we can find some quite moving details about her Assumption into heaven. We see, for example the extraordinary love St. John felt for Mary, his mother given to him as such by Our Lord at Calvary (John 19:27). These revelations below came centuries after the events discussed here. Mary's humility is such that she apparently felt it best not to "toot her own horn" in scripture. We read very little about her in the Bible. Sadly many non-Catholic Christians mistakenly feel that because she is not mentioned much in scripture, prayers to her smack of idolatry. Yet nothing could be further from the truth! 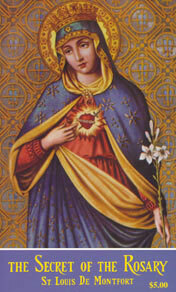 Remember, we honor Mary, we do not worship her, and she always points the way to Jesus. After all, what are her last words in Scripture? "Do whatever He [Jesus] tells you"(John 2:5). Her focus was on her Divine Son and helping others in both their corporal and spiritual needs. We get a good sense of her loving devotion for Jesus and His Apostles and Disciples as they went fourth to establish His church from these passages below. And last, but by no means least, we have these wonderful words from an angel to the faithful as they contemplate the wonder of another body taken up to heaven and an empty tomb "Men of Galilee, why do you tarry here?" We read similar words in Acts 1:11 when the disciples are marveling at our Lord's Ascension. Finally, in case you might ever have wondered why the Assumption didn't make it into the Bible, check out the Blessed Mother's words to St. Bridget of Sweden in the last paragraph of these excerpts. Clearly the Madonna was no Prima Donna! Her Son came first and foremost! Note also we have some prayers and theological reflections on this special feast day here. I realize this is a rather lengthy account, but I've tried to condense it as best I could while at the same time keeping the vivid flavor and flow of this narrative. 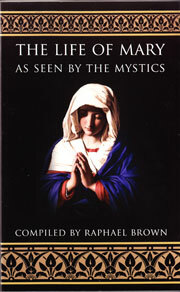 If it intrigues you there's more where that came from in The Life of Mary As Seen by the Mystics, available from Tan Books, Amazon.com, or from our Web Store. This is the book from which these excerpts are taken. More and more as the years passed, the Blessed Virgin felt torn between her ever-increasing longing for union with God in Heaven and her compassionate love for the Church and for mankind. She therefore had to strive to achieve the right adjustment between the active and the contemplative life…Consequently, while remaining actively attentive to the needs and welfare of all the children of the Church, she was also able to be continually absorbed in prayerful contemplation. Toward the end of her life, through the intensity of her burning charity, the Blessed Virgin’s soul had approached so closely to union with God that only the Lord’s reluctance to deprive His Church of such an invaluable guide restrained Him from welcoming her forever into the glory of Heaven. She then began to suffer a ceaseless spiritual martyrdom, for she could no longer hold back the overflowing force of her yearning for Heaven and the Beatific Vision of God; yet she was too humble ever to ask for the privilege of liberation from mortal life…. After the blessed virgin had passed her sixtieth birthday, the Holy Trinity, wishing to reward her perfect generosity in doing the will of God throughout her life, sent the Archangel Gabriel to reveal to her when she was destined to die. Upon entering her oratory, the archangel found her prostrated on the ground in the form of a cross, praying for sinners. The Mother of God respectfully rose to her knees as soon as she perceived Gabriel, who was accompanied by many angels bearing crowns and palms as symbols of various rewards for their Queen. She immediately wrote to the Apostles and disciples to encourage them in their missionary work, and she exercised still greater zeal in strengthening the faith of all the converts whom she met. Although she kept her secret, her conduct was that of a person who is preparing to depart and who wishes to leave all her friends rich in heavenly blessings. "My son and master, in His condescending mercy the Lord has revealed to me that there remain only three more years until my passage into eternal life. I beseech you, my son, to help me during this short space of time to give the Almighty some return for the immense blessings which I have received from His generous love. 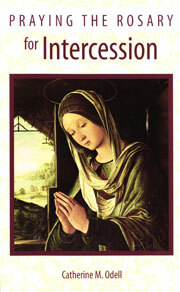 And from the bottom of my heart I beseech you to pray for me." Unable to restrain his tears, John answered: "My Mother and my Lady, help your poor child who is going to be left an orphan . 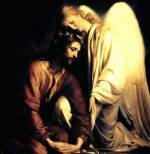 . . " Seeing that his tender heart was stricken with intense pain, Mary gently consoled him and assured him that she would ever remain his Mother and Advocate in Heaven. Although John was at first permitted to reveal the secret of their approaching loss only to St. James the Less, by a divine inspiration the other Apostles and disciples, wherever they happened to be, began to realize that the beloved Mother of their Savior would not be with them on earth much longer. During the last two years of her life, the Blessed Virgin greatly increased her charity work. She healed in body and soul all the sick who came to her. She drew innumerable persons from sin to grace and made many new converts to the Church. She relieved the misery of the poor by giving them whatever possessions or gifts she had and often by performing miracles for them. In every way she generously strove to help the faithful personally before her death. And above all she consoled and encouraged them by promising that she would continue to help all Christians until the end of time. On the morning of her last day, the Blessed Virgin summoned the Apostles and disciples and Holy Women to the Cenacle. They were all deeply moved as they quietly gathered around her. With sad hearts they gazed for the last time at the holy Mother of their God: she was as poor and humble and lovely as ever. They noticed an extraordinary celestial light that seemed to enfold her. Mary rose from her couch, and after kneeling and kissing St. Peter's feet she went to each of the eleven other Apostles for his blessing, and with each she exchanged a touching farewell. She thanked St. John with special affection for all his kindness. She also asked him to distribute her few clothes to a servant woman and to a poor girl who often helped her. "Dearest children, I have loved you with that tender love and charity which was given to me by my divine Son, whom I have seen in you, His chosen friends. My children, love the Church and love one another." "I commend my son John and all the rest to thee, Peter." Then she added, for all of them: "I promise you that in Heaven I will ever look upon you as a Mother." As she ceased speaking, everyone was weeping. Mary's eyes too had filled with tears. Then, glowing with a heavenly radiance, she sat on her couch. And as each of the Apostles, disciples, and Holy Women in turn knelt before her, she blessed them by touching their foreheads with her crossed hands. Next Mary asked all her grieving friends to pray with her and for her in silence while St. Peter celebrated Mass at a small altar in an adjoining room. Becoming absorbed in contemplation, she saw her divine Son coming down from Heaven in glory, accompanied by many saints and angels. Thereupon she prostrated herself before Him and kissed His feet, making the last and most intense act of faith, love, and humility in all her life. 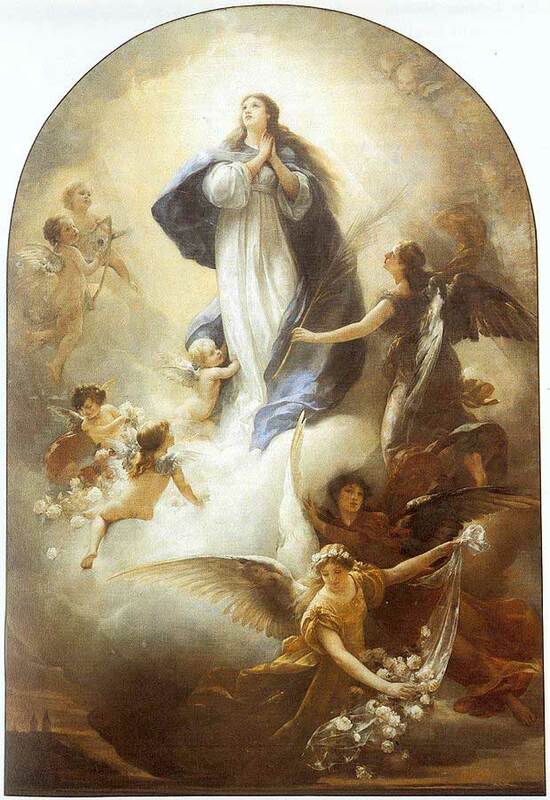 "My dearest Mother, the hour has come in which thou art to pass into the glory of My Father. And since, by My power and as My Mother, I have caused thee to enter the world exempt from sin, therefore also death shall have no right to touch thee at thy exit from this world. If thou wishest not to pass through it, come with Me now to partake of My glory, which thou hast merited. " 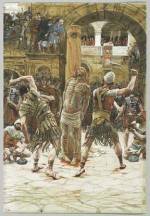 "My Son and my Lord, Thou didst suffer death without being obliged to do so. It is proper therefore that as I have tried to follow Thee in life, so I follow Thee also in death." The Saviour approved her last, generous sacrifice. While the angels began softly to sing verses of the Canticle of Canticles, and the Apostles sadly recited prayers for the dying, St. Peter entered the room and gave Mary her last Holy Communion, after which he anointed her with the oils of Extreme Unction. At this solemn moment the Cenacle was filled with a marvelous light and fragrance which everyone perceived. The presence of the Lord was revealed to several of the Apostles, and the chanting of the angels was heard by many. Now the Mother of God had reclined on her couch. Her plain mantle and tunic were neatly folded about her. Joining her hands in prayer she kept her eyes fixed on her divine and glorious Son. The intensity of her love for Him and the fervor of her longing to be with Him completely transfigured her radiant features. She seemed to become utterly inflamed with the fire of her seraphic charity. On her beautiful face appeared an expression of heavenly joy, and her lips parted in the sweet, gentle smile of her youth. Then the eyes of the Mother of God gently closed. And her soul, without effort, left her body. On the day of the funeral, the Apostles took up the bier and bore it in a solemn procession from the Cenacle to the tomb in the Valley of Josaphat, near the Garden of Gethsemani. All the Christians of Jerusalem, as well as an invisible multitude of angels, patriarchs, prophets and saints, accompanied the funeral, during which numerous miraculous cures and conversions of compassionate Jewish and Gentile spectators took place. 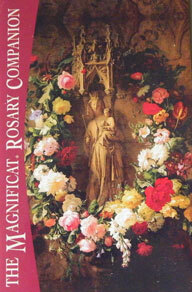 Everyone was amazed at the delicious fragrance and heavenly music that followed the passage of Mary's remains. Meanwhile, immediately after Mary's death, Our Lord had entered Heaven, conducting the pure soul of His Mother at His right hand. And presenting her before the throne of the Divinity, He said: "Eternal Father, it is right that to My Mother be given the reward of a Mother. And since during all her life and in all her works she was as like to Me as it is possible for a creature to be, let her also be like to Me in glory and on the throne of Our Majesty. " This decree was approved by the Father and the Holy Ghost. And Mary's soul was immediately raised to the right hand of her divine Son and placed beside the throne of the Holy Trinity. Later, after the funeral, the Lord descended in a dazzling beam of light, to the tomb of the Blessed Virgin, accompanied by Mary’s soul and by innumerable angels. Then the holy soul of the Mother of God penetrated into her body in the sepulcher, reanimated it, and rose up again united to it, utterly radiant, gloriously attired , and indescribably beautiful. Meanwhile, on the morning of Mary's Assumption into heaven, St. Peter and St. John had been watching and praying at her tomb with some of the faithful. Suddenly they noticed that the music of the angels had ceased. Looking up at the sky, the two Apostles were partly enlightened by the Holy Spirit and guessed that the Blessed Virgin's body might have been taken up to Heaven by God. As they were debating whether to open the tomb, St. Thomas arrived from the Orient. When they told him that Mary was already dead, he burst into tears and earnestly begged them to allow him to have one last look at the Mother of his Lord. Peter and John consented and proceeded to open the tomb. John and Thomas went in and reverently knelt down in prayer. Then John stood up, while Thomas held aloft a torch. There was nothing on the bier but Mary's robe and mantle. In wonder and awe the two saints gazed at the ceiling of the tomb. 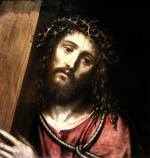 Then John ran to the entrance and cried to the others outside:"Come and see - she is no longer here!" St. Peter and the rest entered two by two in the narrow grotto. In mixed joy and sorrow they all wept as they slowly realized what an extraordinary honor and privilege God had accorded to Mary. Peter carefully folded and took with him her mantle and robe. Then they all stood outside the tomb and sang hymns of praise to the Lord and to His holy Mother. Then celebrating this first feast of Our Lady's Assumption with deep joy and peace of heart, the Apostles and disciples went back to the Cenacle, praying together and singing hymns of thanksgiving to God. "…Those persons who were in my house with me when I gave up my spirit fully understood what divine mysteries I was then experiencing; because of the unusual light which they saw. Thereafter those friends of my Son who had been brought together by God buried my body in the Valley of Josaphat. Countless angels accompanied them. "That my Assumption was not known to many persons was the will of God, my Son, in order that faith in His Ascension might first of all be firmly established in the hearts of men, for they were not prepared to believe in His Ascension, especially if my Assumption had been announced in the beginning." Four Great Prayer Resources Available in our Web Store!